Despite the fact his name now adorns the Charlotte 49ers' new 15,000-seat football stadium thanks to a $10 million donation, Jerry Richardson said Tuesday it was unlikely his NFL Carolina Panthers would utilize the facility or move its annual training camp from Wofford College in Spartanburg, S.C. The Panthers have held their training camp at Wofford, Richardson's alma mater, each summer since their inaugural campaign in 1995. "It's an opportunity when we go to South Carolina because we call our team the Carolina Panthers and it's an opportunity to reach out to (those residents)," Richardson said. "I don't think that would be the right thing to do. "Plus, the people at Wofford have been very good to us and they graduated me with a 'C' average." He can afford a $10 million donation but the taxpayers have to pay to support his business....yeah that makes sense. From alum from the Charlotte class of '73. GO NINERS! Naysayers: just GO AWAY and complain to someone who cares. What a weasel. First he fleeces the taxpayer, then has to plaster his name all over everything. WHY DID YOU NOT DEMAND THE IDIOTS AT UNCC WHO ARE NAIVE TO SEE HOW STUPID THEY LOOK, CHANGE THEIR NAME TO CAROLINA 49ERS SINCE IT WAS ROSE WHO STARTED THIS "UNC-LESS" CRAP OBVIOUSLY JEALOUS OF UNC SINCE SHE WAS A USC-ROCK HILL GYM TEACHER GRAD? THAT IS INCLUSIVE OF BOTH UNC AND USC. WAS THAT NOT THE ORIGINAL CONCEPT BEHIND YOUR NFL TEAM IN 1995 ANYWAY? INCLUDE BOTH CAROLINAS AND NOT JUST USE SOME WORN OUT REDUNDANT INSIGNIFICANT UGLY DEAD GERMAN QUEEN NAME THAT SOME SOREHEAD IDIOT DEMANDED? Thank you Mr. Richardson. This donation made a huge positive statement in so many ways. Perhaps Anon 6:35 has a point (although I'm sure he did not mean to). Perhaps we should change our name to "CAROLINA". The team in Chapel Hill can still be UNC-Chapel Hill and the team in Columbia can still be "South Carolina", but we can THE CAROLINA. 6:35 anon using cruise control for cool. I enjoyed your anger, keep it up! I agree - the 49ers are not just the City of Charlotte's team. With Jerry's investment we are now The Carolina's Team! GO NINERS! Thank you Mr. Richardson! Jerrys $10 million dollar gift will not go to the football team or stadium improvements. We need to make sure we are Title 9 compliant first! True, Judy will not retire until we are fully Title 9 compliant and the mens basketball team is completely decimated. I really don't buy the fact we have our training camp in SC. The fact is SC couldn't care less about the Panthers. Look at this map. 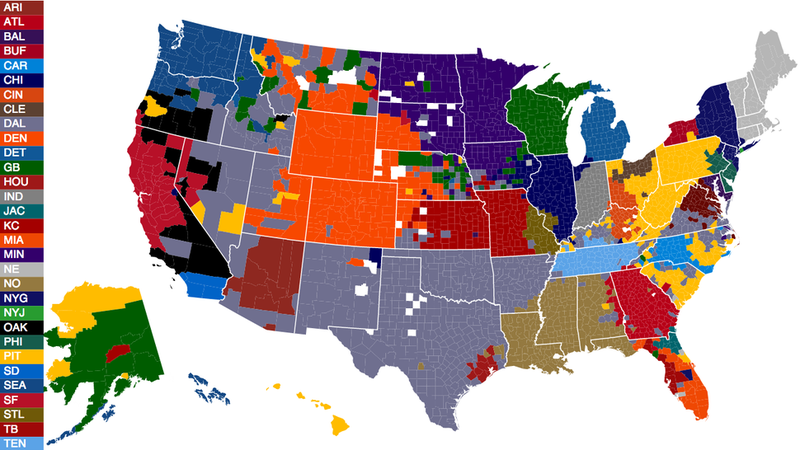 It is a map of NFL fans by county based on FB likes. SC is Steeler Yellow. They need to start supporting the Panthers or we should rename the team. Judy is evil. Judy only cares about women's sports. Judy has bad hair. Yada Yada Yada. Does this agreement put Jerrys name on the stadium forever? Or can we rename it after he dies? Everybody knows we need to keep part of the $10mil to go to another Alan Major contract extension - or to buy him out when we fire him in a couple years! Thank you for sharing! This is such an informative blog. Me and my bullion buyer appreciates this so much. Actually, athletic directors are in an impossible spot regarding coaches contracts. Unlike you they can not predict the future. Extend the coach and he bombs and you are called an idiot. Don't extend the coach and he does brilliantly and you are called an idiot. Extend the coach and be right and the coach does not honor the contract and gets a " better" job, and get no credit. But i'm sure the poster could handle the job because he is...Nostradumbass. Give a coach a 4 year extension and fire him the next year - I will call you an idiot. Hire a coach with no personaility to sell the program - I will call you an idiot. Give that coach a three year extension when he is <.500 and who has two years remaining - I will call you an idiot. So from what I've read - Jerry approached Judy about making the donation. Thats just about what I have thought - Judy has done nothing for the capital gifts campaign other than rely on Dale and Mac. And if this is lifetime naming rights to the stadium its a horrible deal. I thought we were going to be like UNC-P and sell off individual parts of the stadium (locker rooms, press box, concession stands, hospitality suites) to donors.... nope. Looks like Joe Blow has his head stuck permanently up the Scam Newton butts who after going 11-11 in high school as a nobody spent his one fall semester at FL behind super star Tebow who won 2 NCAA titles and a legit Heisman. Richardsons scammer pretend mediocre retarded Qb cheated 3 times at Florida and stole a 2500 laptop and charged for 3 felonys and was kicked out of school going to a community college before the cheat scamming 200k from Auburn for one fall semester and signed by fatboy Richardson. Here comes the idiot hype for nothing on a mediocre team. UNCC 49er players need to study hard dont lie dont cheat dont scam the system like Ricardsons pretend QB who has 1-2 more seasons left in the NFL at best. Upstart UNCC 49ers need to schedule a scrimmage and beat fatboys weak pink panther team at Richardson Stadium. I hope the Horny-cats sign Chris Bosh! He is the sexiest player in the NBA! He can fit nice with my dreamboat Cam Newton!!! Ridiculous. Richardson investing in a glorified community college with unholy amounts of his personal wealth. Meanwhile, he's begging every self-sufficient entity in Charlotte for money to keep his shadow of a franchise afloat. I thought you went to Wofford, Jerry. You're making business decisions like you went to school at that trucker college in Harrisburg on which you just waisted $10 Million. As someone who has devoted themselves to labeling Charlotte as inferior to APP State, you seem to spend a significant amount of time devaluing any positive thing that happens to our program. Get over yourself. You are full of crap if you try to state that you wouldn't have happily taken Richardson's 10 million to remove the track from your stadium. That was interesting on Newton and it is hard to believe he was so pathetic in high school but checking Max Prep for WestLake HS he was indeed 5-5 in 2006 and 6-6 in 2007. That is terrible. There is no possible way he would have played for the 49ers then or now. We have a few QBs who are awesome. He would never have made it as a walk on. And there is no doubt if Richardson wants to bring his NFL team to Richardson stadium he would get a good game but we know he is scared to get shown up. Just give us your money.